Hi everyone, I'm sorry to say that I'm on Hiatus again! I wrote this post five days earlier and when this post goes up; I'll be up in the air on my way to Hong Kong!! (This post is already set to be posted on this day. It's good that we can do this. LOL) Yes, guys, I'm GOING TO HONG KONG for Three Weeks and I hope I'll see some Artistes when I'm there!! (finger crossed..lol.) I'm so excited to go to Hong Kong and I really hope that I'll see some artists there! And If I do, I'll definitely tweet about it! Follow my twitter if you haven't already! I'll be leaving Monday, July 29th and I am absolutely excited!!! Another reason why I am on Hiatus again is because by the time I get back to the US, school starts already. 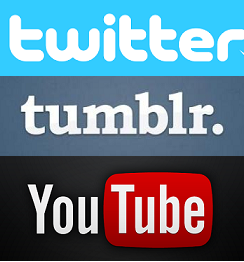 Therefore, I won't have time to blog :[ sorry guys! I transfer to a new university and I want to focus completely this year with my school work. This university has a really amazing science program, it is known for its science and I am majoring in Biology and onto the Pre-med track. Although, this isn't an Ivy League University, its a local/state university that is an hour away from me, but it is one of its best local/state university in the country. The science program is extremely hard to get into and I am happy that I got accept into it! If you guys remember back in my other posts, I had mention that I am transferring university, yes this is the university I am transferring to! And since I am in, I want to do as well as I can and graduate on the Dean's List. And hopefully from there I can go off to Medical School. I really hope I can become a doctor, this is what I am aiming for (even though, I secretly do wish to become an TVB actress LOL and definitely my biggest Dream is to become Miss Hong Kong, but I got to wake up..haha. LOL.) therefore, I hope I can pass my Mcats (medical school entry exam) and get into a medical school and make my family proud! P.S. and if I do not come back by Christmas vacation; I want to wish all of you a Very Happy Merry Christmas and Happy New Year!! Wish you and your family the very best, health, and happiness!! I want to make a quick thoughts on Triumph in the Sky II. I had watch the prequel, Triumph in the Sky I back when it was release, but at that time I was so young and didn't know what was going on. I watched it for entertainment and mostly because my family were sitting around the TV and watching it, I thought why don't I join them. But of course I remember, Issac, Roy, and Francis! The three pilots that made a return for the sequel. I'm pretty upset that the other cast can't make a return, but oh wells.. we should see what the sequel have install for us. Truthfully, I'm not really that fond of the role Fala is playing. I was really hoping that Flora or other fadans will be back for that spot. And I was thinking that Fala will play a different role, well I guess her same character, but not that exact spot. Am I making any sense? I was thinking that Fala should be paired with Kenneth instead.. (I think this is what I was trying to say? I'm not sure myself. LOL) But I guess we should watch on and see what is installed. I really do like her eyeliner look in the beginning episodes. Hahaha. Also the scene where Fala broke down and cried because she found out that her boyfriend was going to propose to her, but he never showed up. That scene was really emotional, I understand that people said that she was crying with no tears, but I thought that she did put a lot of emotion and feelings at that part. It moved me and I cried. 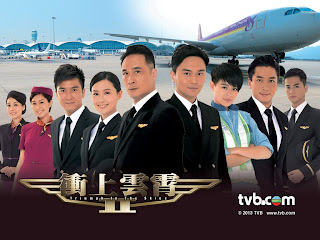 I also want to watch this for Chilam and Myolie sibling relationship. I can see that Chilam really cares for her sister and even moved into that small little room thing..haha. He would do anything for her and Loved her dearly. He got really upset when he found out that Myolie gave all his present to her away. And the scene where he got locked outside and ended up at the police station. Myolie went to bail him out and outside of the police station, Chilam yelled that he is her brother not some other person. I wonder what happen that made Myolie mad at him for so long? Hahaha.. its funny how others thought that they used to date and Myolie's team are jealous of Chilam. Hmm.. excited for them to make up! Chilam is one big brother that will protect his sister! 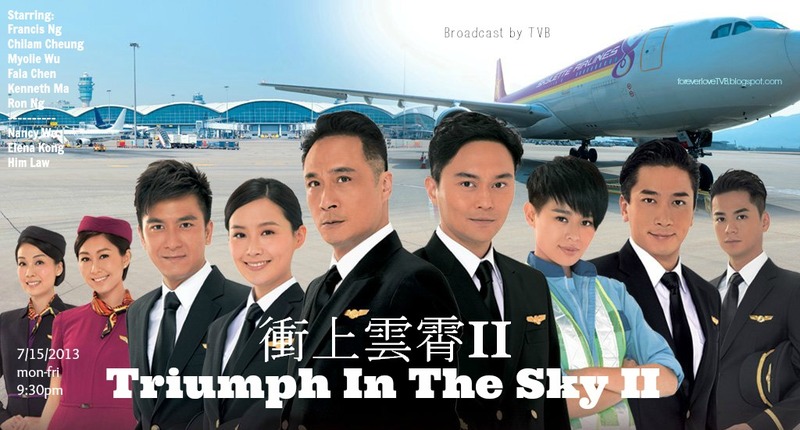 This is the second sub theme to Triumph in the Sky 2. I fell in love from the first time I heard this! The melody is beautiful, the song itself is beautiful. The lyrics match the series really well and I can't wait till the full version is out! This is only the shorter version of the song. The sub theme to Triumph in the Sky 2. I love love love this song! It fits the series so well and the song itself is just beautiful! A very good song and a very well done by Mag! This is the sub theme to Karma Rider and I thought that the song is pretty good. I like it and heard that this was originally by Denise Ho. I immediately fell in love when I first heard it! This song was beautiful and Edwin is such a great singer! This is the theme to Reality Check and I really enjoyed the theme song. Ruco also sang a solo version and that is without the dialogue from Louise. I felt that the theme song really bought out a good meaning/message and fits the series perfectly. Throughout my years of watching TVB, I've came across a few fadans. I definitely do not know any big fadans from the 80s and not all from the 90s. I only knew a few fadans from growing up and I've enjoyed their performance. I really do hope that one day I will get to see them on screen again. Also correct me if they are not from the 90s? This post is called the "Golden Fadans" because I want to categories all the past fadans that I had watched growing up and liked. The Dong Ka FaDans won't be in this post, but will be in a separate post. I think the Dong Ka Fadans are: Kenix, Jessica, Maggie Cheung, Ada, Esther, and Flora right? Hahaha.. that's what I've been following all this time and I guess they will be my Dong Kas! Okay, lets get started with this post. The first fadan I want to introduce is Joyce Tang! From my memories clearly, I think my first series of her was from "Arm Reaction I". I really enjoyed the Arm Reaction series until they changed the cast LOL. But nothingness, I still enjoyed the other installment (was it the last installment that was different lead?) I really really enjoyed watching Joyce and thought that acting was natural and smooth. She's been with TVB for so many years and has been leading, but after she return from leaving TVB, her screen time were reduced and got pushed back as supporting. That is a pity, but still I get happy when her series gets aired, although, she's not the lead anymore. Next of course, Gigi Lai, one of my favorite! She is absolutely amazing and loved her acting! It's all natural right there and her tears and crying scenes, perfect! Nail it all! I just love her so much and I of course miss watching her! I hope that one day she will return back onto the screen. I don't remember what was my first series of her, but I do remember her character and performance from "The Dance of Passion." Her performance there were amazing and beautifully done. 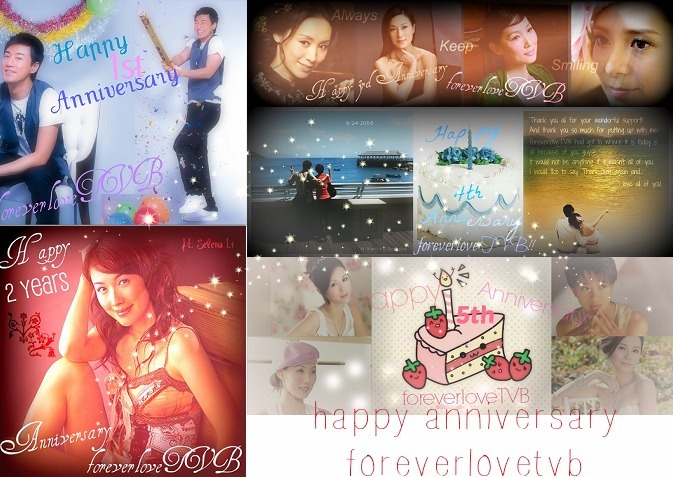 It was perfect and I think that year was when I launched foreverloveTVB. I was obsessed with TVB that year...hahaha! Melissa Ng..ah.. of course I love love love her! Where would I be without her..lol jk. But I seriously miss her so much! The last series I saw of her was "The Master of Tai Chi." She got pregnant and left the screen. I hope she will make a come back too! She is amazing and just beautiful! Saw her news around the other time and yep, she still stunning! Charmaine Sheh, I don't know what was the first series and don't remember her last TVB series I saw either. Hahaa.. I think the last was "My Sister of Eternal Flowers" but not so sure. Her most memorable series to me was "Perish in the Name of Love" her character and chemistry with Steven Ma was amazing. Charmaine Sheh is one of the best actress that can handle any scenes and type. She is truly a Big Sister and Best Actress. I felt that no one really fits her place after she left TVB, but the five fadans today were great in their own ways! Sonija Kwok, one of the prettiest fadans in TVB! I know she is still in showbiz, but I am putting her here because I felt that she stays home more now. She is still very stunning and one of the last Miss Hong Kong that won Miss Chinese International so far. No one had succeed her yet! The one that won all the awards home during her MHK and MCI years! Amazing and Wonderful, also I heard from others that saw her in person, they all compliment that she is definitely very beautiful and stunning! I really love watching Sonija and I know that she share a great bond with Steven Ma. And of course, their chemistry are spontaneous! I love watching them as a pair, they give off so much chemistry and it just melts!! Haha. I'm remember her character in "Perish in the Name of Love" she plays Charmaine older spoiled sister. I'm not sure if that was the first series I saw her in? But I think it is! Her ancient look is beautiful! Michelle Yip is one of the best actress that I love! She is very pretty and her ancient look are stunning. I truly do miss seeing her on TV screen and hope that one day she'll film a TV drama again! I know that she went off to the big screen and is doing so well, I am happy for her! I remember her performance in the "Triumph in the Sky I." As a newcomer, I thought that she did well and couldn't wait for her other series. But as time went by, she got famous and went off to the big screen. I think that was the first series I saw of her! And yes, I think she was the only MCI winner from New York, no one had succeeded her yet. I thought Fala did, but Fala came second. I'd fell in love the first time I heard this song. It was absolutely beautiful. I loved the chorus, lyrics, and the melody. No words for it, it is just pure beautiful. But I can't help to think that he is singing this song out to Myolie..LOL! (-sigh- hope one day they will get back together? Still have a chance?) He really sang this song with lots of feelings, I can feel it...haha. I don't know, but just something about this song that I really like about. The melody is actually pretty nice and smooth and kinda creepy..hahaha. But I really enjoyed it and I'm a fan of her songs! It's a pretty interesting song and it fits the serial nicely. I really like this song. The melody and everything is really nice and smooth. It fits nicely and of course it is sang by Niki Chow! Hahaha.. Niki also sang a solo of this song. Love love love this song once it came out! It is beautiful and amazing! I actually find Mag has a really strong voice. Her voice its actually powerful and I am amaze! I know this song is softer, but I did listen to her other songs and it was powerful. Hahaha.. this song is actually kinda nice! I like it and its enjoyable! For this month's favorite songs, I had plenty and most of them are Chinese! Hahaha.. okay lets get into it! Hahaha.. yes, there are more Chinese songs this time around. Lol. I've been listening to Final Blessing by Bosco Wong the most and I feel sad each time when I listen to it. I felt like Bosco is singing this song out to Myolie! lol. He had put so much feelings into singing it and I love the lyrics and tune! Its an amazing song. Where should I begin with this series. I really didn't expect anything from it. It was fun to watch and very relaxing. I really enjoyed watching it and definitely I will re-watch this. It is not draggy and you'll laugh in every episode. The comedy in this is just priceless. I really have nothing to say except one word that will sum it all, AMAZING!! Yes, this series is truly amazing and I really did enjoy it. 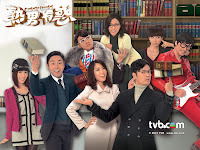 I hope TVB release more comedy and laid back series, something that is more relaxing and will release your stress. This series is definitely one of those that will help ease your mind. Nothing to worry about and just sit back and watch with no worries. The series had an great cast and it brought out the love and the warmth from them. I felt the warmth and love as a whole, it really made the serial even nicer to watch. I really like how the cast combine as a whole, it really seem they had fun filming this. Some series that I had watch, I can't really feel the warmth and love from the cast. But this series it had bought all those onto the screen, which it creates a very warmth atmosphere. 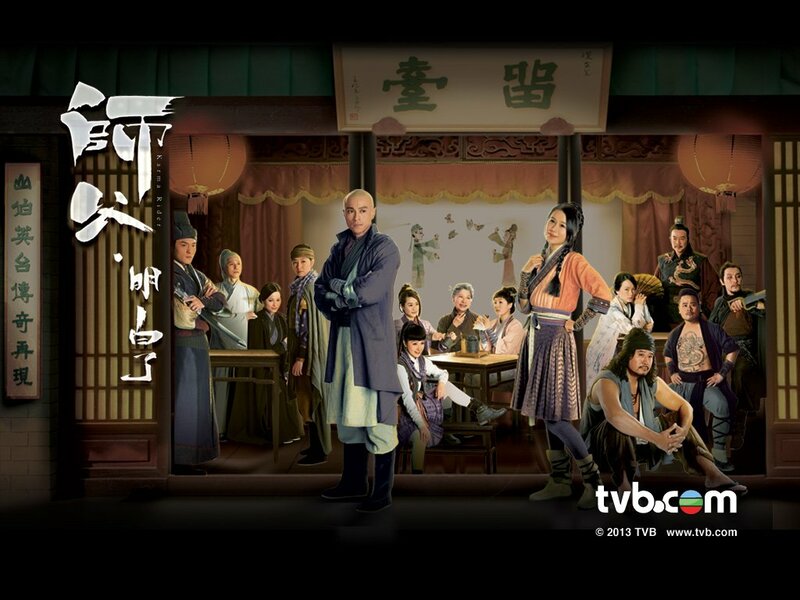 This is one thing that I really like about this serial and hope that other TVB series will be like this as well. I really felt the bond between the cast! Other than that, definitely got to be the comedy. 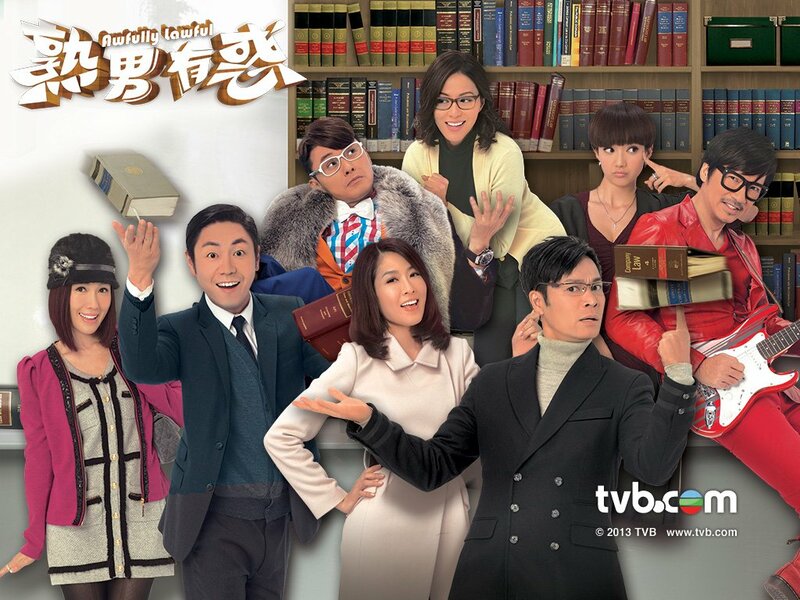 When was the last time I had watched an amazing hilarious series from TVB? I don't remember.. haha, but seriously I had to laugh out loud in every episode. I clearly loved the comedy, it is perfect and wasn't extremely forced or irritating. It was clearly pure amazingly funny. Favorite characters? Hahaha.. I got plenty, basically all.. hahaha. Okay, I seriously loved the two boys in the serial. Felix and Louis, they play twin brothers, but they are really not twin nor brothers. They are actually cousins. Felix is Sharon son while Louis is Joyce and Raymond's son. Six years ago, Sharon left her son in the care of her sister to find her ex-boyfriend. She had regretted that decision and return to Hong Kong. After she had return, she followed her sister around and when Joyce, her sister found out that Sharon was following she had told her to get lost. Joyce was really mad at what Sharon had done in the past and had not forgive her since. But later in the serial, they had made up and live together. Felix didn't know about his birth mother until the very end of the show. Although, they didn't show it, but I'm pretty sure it was clear that he knows who's his mother. I'm serious, these two boys are adorably cute and hilarious. They are four in the show and as four years old, what they say are pretty funny. They are just SOOOO Cute and Funny!! I just want to pinch their cheeks..LOL. Selena on the other hand is also one of my favorites. She plays a spoiled rich girl, but this time its not irritating nor annoying. Its adorable and funny. I loved her personality in here and the way she dressed! Her wardrobe is beautiful and her wigs..haha. Each time its different to match her outfit. She is obsessed with her husband, Master Fish, played by Johnson Lee. They are so cute and hilarious. Selena would watch him like a hawk and if there is a girl pass by him, she would get jealous..haha. She is also a lawyer like the rest of them and its nice to see that she won a case. During her case with Johnson's aunt, she didn't ask any questions or anything, but she still won! Haha. It was pretty funny how she got so upset that she was pregnant... overall her character was definitely likeable. And of course the four guys! You got to love them! They shared an amazing bond and love! They are so funny and especially when they come together, its speechless. I just love seeing their scenes especially! Its so funny and they do not take their job seriously. First we got Ming sir (Raymond), Solo (Roger), Fish (Johnson) and lastly Jazz (Pal). They are hilarious and love their group pictures..haha. Ming Sir and Jazz are partners of a law firm and they recruit Solo and Fish to join the firm. They didn't really want to work, but when a case comes on they will work diligently and seriously. Ming stole the company's money and left, after he return he was completely different. Like a 360 degree turn, a midlife crisis it looks..lol. But he was funnier than ever, at first I wanted to kill him..hahaha, but I forgave him. Solo of course from his name, we all understand what that means. He even named his car Island. But eventually, he broke out of his "island" and fell for Sharon. Jazz dream about being an singer and love music and never want to be a lawyer. And for Master Fish, well he is Selena's husband and I guess he was the normal one in the group? Well Roger is normal too, but they are all funny! Overall, I really enjoyed the show and it was definitely a perfect comedy. Well, I guess you can't really say perfect, but it was decent and up to your expectations. It was to me, I thought it was hilarious and enjoyable to watch. Definitely something to watch after a long hard day, something to keep your mind from all the craziness. Two parties are meant to fall in love but not be together, leading one to die and one to regret. Surprisingly, after three hundred years, such a legend recurs in the hometown of Liang Zhu - the Butterfly Lovers. Losing his parents at a young age, CHOR YAT-CHIN (Raymond Wong) was rescued by his lifesaver, so he vows to grow up to be a constable, upholding justice and punishing evil. On his first day to report for duty, he solves a major case, which makes the chief constable CHING YING-HUNG (Mat Yeung) so jealous that he deliberately dispatches YAT-CHIN to catch a murder suspect WAN TIN-BONG (Mak Cheung Ching). As such, different characters are drawn into a complicated and confusing predestined relationship. While tracking down TIN-BONG, YAT-CHIN comes across a thief, FOON HEI (Priscilla Wong). Being in opposition to each other as constable and thief, the two are utterly incompatible, but FOON HEI has saved YAT-CHIN over and over again. In light of YAT-CHIN’s constant dreams of Liang Zhu, FOON HEI, together with her sisters FOON SIU (Cilla Kung) and FOON CHING (Leung Ka Ki), shape herself as an incarnation of Zhu Yingtai, in hopes that YAT-CHIN will believe their love is predestined. Out of the blue, with a sudden appearance of a wealthy businesswoman WU DIP (Yoyo Chen), YAT-CHIN is unable to extricate himself from the unrequited love. Later on he even becomes love sick as if he were Liang Shanbo, collapsing after a setback. Meanwhile, his lifesaver of a young age shows up in front of him again….. Triumph in the Sky II!! Premiering tonight 7/15/2013 at 9:30pm! along side with new added cast! Stay tune with what the new Skylette Airlines will bring you!! Zoe will only return for few episodes in the beginning. She had passed away and Myolie will take up a new role!